Just wanted to share with you all one of my most favourite eye shadows, MAC Antiqued. You know, when I think about it, I don't own any duds when it comes to MAC shadows. Maybe it's because I spend countless hours searching online for reviews and swatches before I buy anything. It is a well thought out process! I know, I sound quite obsessive, but when you're parting with 7.5 KD (That's $25), it better be good! 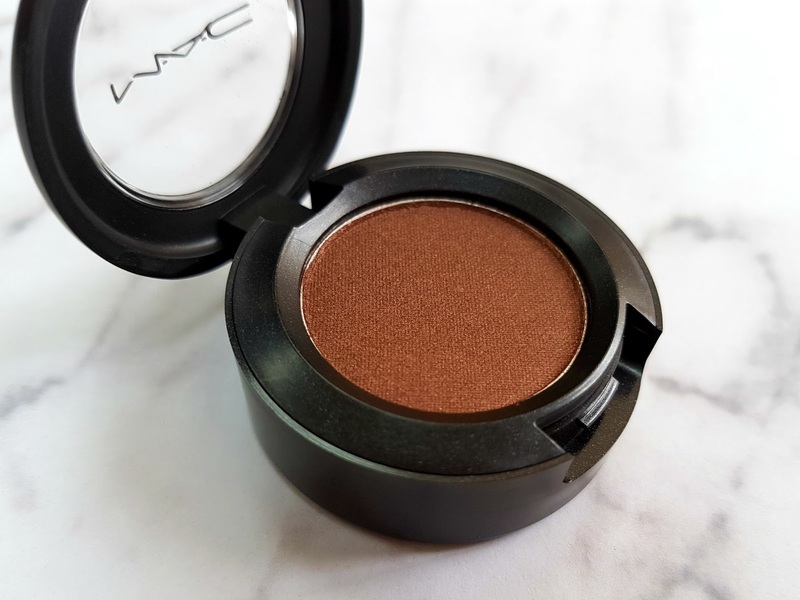 On the MAC website, Antiqued is described as an ash brown with bronze and has a veluxe pearl finish. To be honest, I cannot see the "ash" part of the description at all and I'd describe it as a warm rusty brown with hints of copper. Definitely an Autumnal colour, though you really could wear this all year round. When I look at Antiqued, I imagine this would be the shade Indian brides would gravitate towards and I see myself wearing this with a lot of Indian party wear. It's also the ideal crease shade to warm up an eye look or just quickly swept over the entire eye when you're short for time. My lazy girl one shadow routine has me reaching for Antiqued quite a lot these days and I am in love with that metallic sheen finish. Antiqued has a soft and smooth consistency with awesome colour payoff and no fallout! Application is unbelievably easy and the shadow blends like a dream. Actually, I think that speaks for most non-matte shades right? On its own, Antiqued has pretty decent staying power, but worn over a paintpot or primer, this will last all day with no creasing. I also love how this is part of MAC's permanent collection. 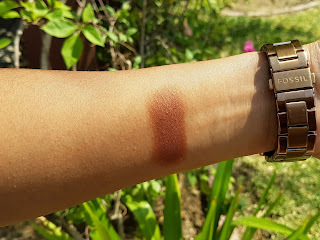 I took the liberty of adding two swatch photos above, one taken in the shade and the other in bright sunlight so that you can see for yourself just how truly gorgeous a colour Antiqued is regardless of the lighting. Though a very warm shade, I've seen this worn on cool skin tones and the colours pop just as beautifully. Definitely a MAC must have! Do you have Antiqued in your collection? What are your other must have MAC eye shadows? Oooh!! What a gorgeous shade!! Gonna get this particular one asap! I've been thinking a lot about doing up my eyes a bit when I go for work :) So gonna start out with this! I usually go for cooler browns but that is gorgeous! Definitely a great fall color. Thanks for sharing. Yup, perfect for autumn! I love the texture too and how easily and smoothly it applies. Thank you for stopping by. This is such a gorgeous autumn colour!! 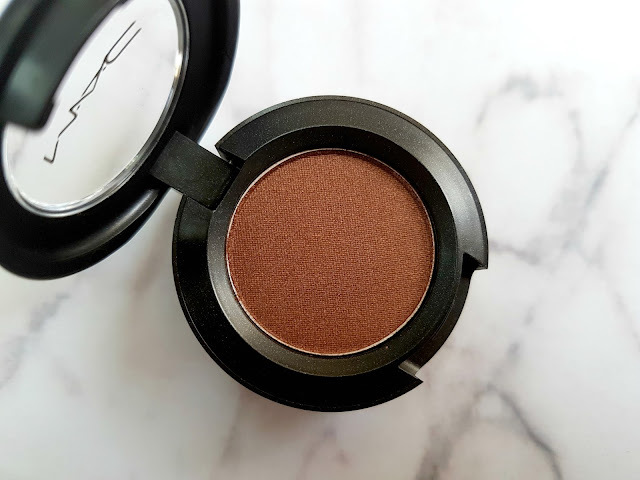 I love mac eyeshadows, the colours are so pretty and 9/10 they have great payoff! I really love coppering aswell, have you tried that? Oooh, I love coppering too! 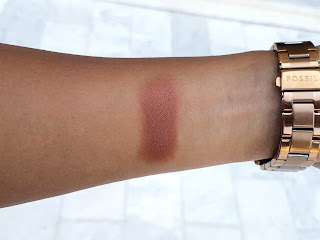 I don't own it, but I swatched it in store and it is gorgeous! I haven't tried this one. I love all things MAC. Right now my current fav is wedge, which is just a neutral no shimmer that I pair with different shimmers. It's(wedge) a little light on me, but its a great neutral shade right? Such a great shadow. One of my favourites!! It really is right? Thank you for stopping by. such a cute color, love MAC products! Me too! They have every single colour imaginable and they're just amazing quality too!